In Tarot circles we sometimes talk about cards ‘stalking’ us. These are cards that show up in pretty much every reading we do and we often struggle with the exact meaning of these ‘repeat offenders’ even though many of us have years and years of experience and some of us are professionals. The reasons stalker cards are so difficult to read for oneself is because they reflect a shadow aspect that is coming up for healing. I came up with a simple little spread which will hopefully help you shed light on any ‘stalkers’ and can also be used to bring a theme card into sharper focus. Sure, this card has showed up in some of the readings I have done about various topics throughout the year but I can honestly say that I might as well have embroidered a spread cloth with this card’s image – that’s how ’10 of Swordsy’ this year has been. 4. How I am doing now. The King of Swords shows up to let me know I’m using the intellect to analyse the situation. Well played, Tarot, well played. 5. Feel free to correct me if I’m wrong but I take the Knight of Swords here as potential pass. Why? Well, because he resonates with the Aquarian Star card and because it happens to be my birthday courtier (last decan of Capricorn). Yeah, I know he’s not perfect but he’s not a quitter and he’s more than willing to detach himself from his personal woes to get to the truth. In fact, he would lay his very life down for the truth. 6. Thank you, Raguel. It’s nice to know that my personal relationships are seeing some angelic intervention. Not that there is an all out war going on here but this has been a year of serious uninvited meddling by people who really did not have my best interests at heart. T’would be nice for that to end. Cheers! ETA January 2016: It did end, of course. No situation, no matter how bad, lasts forever. 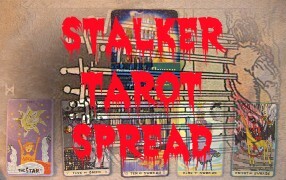 My latest stalker card is the 8 of Wands. I’m glad I found this oldie but goodie in the archives because I do believe it will come in handy!